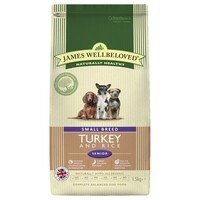 James Wellbeloved Senior Dog Small Breed Turkey and Rice is a complete hypoallergenic dry food that has been designed especially for smaller breed dogs that are over 7 years of age. Containing selected protein source Turkey and selected carbohydrate sources of pea and potato, the dietetic food has been made with only natural ingredients with added vitamins and minerals, and is ideal for dogs with skin or digestive sensitivities. Turkey Meal (22.5%), White Rice (22.0%), Brown Rice (19.5%), Naked Oats, Turkey Fat (3.8%), Whole Linseed, Sugar Beet Pulp, Turkey Gravy (2.9%), Alfalfa Meal, Pea Fibre, Tomato Pomace, Carrots, Seaweed, Dried Vegetarian Stock, Omega Supplement*, Potassium Chloride, Sodium Chloride, Parsley (0.125%), Nettles (0.125%),Taurine (0.1%), Chicory Extract (0.1%), Calcium Carbonate, Cranberry Extract (0.05%), Green Tea Extract (0.05%),Glucosamine (0.045%), Yucca Extract (0.02%), Chondroitin (0.005%).